West Virginia Writers and the world lost one of its brightest stars Friday when Ethan Fischer succumbed after a long battle with cancer. He wrote mysteries for radio and poems for posterity. He produced The Rumsey Radio Hour where Ethan made famous his "Johnny Dime the Poet of Crime" routines. 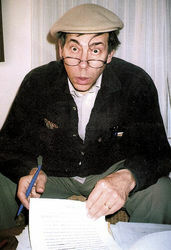 His work has appeared in the following places among others: Potomac Review; Dickinsonian; WPFW Anthology (next to Ferlinghetti); Antietam Review; A Public Hanging; POETRY; Free State; WV Magazine; Works on Walls; Virginia Country; The Muse Apprentice; The Pembroke Magazine; Mountain Pathways; Tuscarora Review; Ruby. In 2009 when Grace Cavalieri hosted the series, "The Poet and The Poem" from the Library of Congress featuring U.S. Poet Laureate Kay Ryan and several other noted poets, F. Ethan Fischer was included and aptly so. The radio series is available to all public radio stations via the Public Radio Satellite System's ContentDepot. His book Beached in the Hourglass was published by The Bunny and Crocodile Press and his work may also be found in "Wild Sweet Notes: 50 Years of West Virginia Poetry. He was senior editor of Antietam Review and he broadcast news over WRNR. He taught English & Creative Writing at Shepherd University where he found among his students, stars of the fertile void, but there was so much more to this man. Ethan Fischer was a lawyer, a writer, an actor, a poet and a broadcast journalist. Topping his personal joy list, however, is his life, and work, as a teacher. As an adjunct professor at Shepherd University, Ethan taught English literature, creative writing and poetry. "It's such a privilege," he said. "I love my students. They're a scrappy bunch with a good attitude." His work also took him to Frederick Community College where he taught on the graduate level; and to the parks in the summer where he taught "Young Poets in the Park" for years. As Ed Zahniser said, "He taught them from 8 or 9 to 80 or 90." "I get to work with true genius before it gets stepped on. It's perfect," said Ethan. He also established an ongoing independent poetry program for Shepherdstown students. Ethan was a contributing senior editor for the Antietam Review for years. He was the visiting poet/teacher/editor to Bluefield College, and conducted writing lecture-workshops for the West Virginia Writers, Inc. - of which he was elected vice president - the Sotto Voce Poetry Festival, the Arts & Humanities Alliance, Veterans Administration Hospital programs, Antietam Review, Hagerstown Community College Writer's Day and the Arts Centre. He chaired the annual New Writers Fiction Award, as the faculty adviser to Sans Merci and writes for the famous, infamous and widely broadcast Rumsey Radio Hour. His work has been published in the Potomac Review, Dickinsonian: WV Magazine; Virginia Country; WPFW Anthology; Antietam Review and the list goes on. Ethan is married to Ursula Nottnagel and they have made their home in Harpers Ferry for years with their three children. He might live in Harpers Ferry but finding Shepherdstown he recalls, "You love finding the community you've been looking for." He loves the fact that this town supports so many arts events. Seems like when you arrived in Shepherdstown you could find him at his favorite venue. He loved the Blue Moon for giving poets and musicians, young and old, ongoing opportunities to perform. To quote the devoted patron, "This is where it's at." Ethan Fisher was a writer and a poet but above all else, he was a teacher. Among his students are, as he says, "stars of the fertile void to come if we are not careful. Yet poetry forever stays 'a night train ticket out of time.'" A memorial service for Ethan Fischer will be held Saturday, July 9, 2:00 p.m. at Presbyterian Meeting House Washington and King streets in Shepherdstown. Reception to follow at the home of Carlos Niederhauser and Liz Wheeler, North Princess Street, next to Jefferson Security Bank, Shepherdstown. Service will feature remembrances (5-6 different aspects of his life--father, teacher, mentor of youth, poet, editor, entertainer) plus the reading of six of his poems presented by different voices. Readers and poems to be selected. Laura First and Don Oehser will present music, as will Dianne Holliman.